Your endocannabinoid system (ECS) is in charge of keeping your body in balance and regulating functions such as hunger, pain, mood and sleep. It can use cannabinoids your body makes (called endocannabinoids) as well as plant cannabinoids from cannabis products, like CBD oil from hemp. (It’s versatile that way.) Both kinds of cannabinoids attach to the very same receptors, called CB1 and CB2 receptors. How does your body make its own cannabinoids? From Omega-3 fatty acids! [i] These fats also come in handy when your body is processing plant cannabinoids. Why? 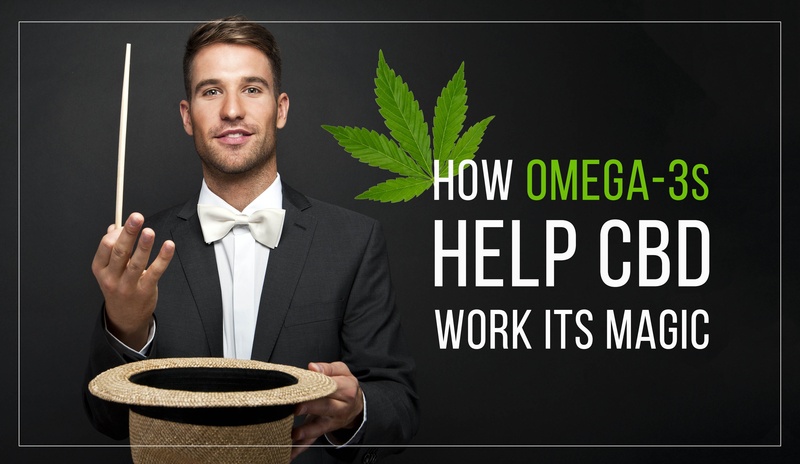 Because cannabinoids are fat-soluble, which means they need to be in the presence of fats like Omega-3s in order to be metabolized. So, what happens to your ECS when you’re not getting enough Omega-3s? The interaction between Omega-3s and the ECS isn’t a theoretical question, because like the mice in those experiments, most Americans don’t get enough Omega-3 fatty acids in their diets. Fatty fish like salmon, cod and tuna are some of the best food sources. Vegetarians can get Omega-3s from walnuts, flax seed and seaweed. Since most folks don’t eat those foods frequently enough, though, taking a fish or flax oil supplement can be a good insurance policy. However you get your Omega-3s, your endocannabinoid system will thank you. [ii] Lafourcade M, et al. Nat Neurosci. 2011 Jan 30;14(3):345-50. [iii] Manduca A, et al. J Neurosci. 2017 Jul 19;37(29):6851-68.